Babies grow quickly, and you'll want to capture as many memories as possible by taking lots of newborn baby photos. You know how you feel when someone says, "Smile! I'm taking your picture!" For most of us, having our picture taken isn't something we really enjoy. The good thing about newborns is that they haven't discovered yet how to say no. At least not in the traditional manner. However, they will be the main judge of when a photo-op is a good idea, and it doesn't matter how you feel about it either! Timing really is everything when it comes to taking newborn baby photos. The great thing about them is that your baby doesn't have to do anything to look absolutely adorable! You can take pictures of her sleeping, feeding, or simply lying in her crib or bassinet. Remember how you examined every finger and toe of your newborn right after he was born? Each body part of your baby is precious, so who says you have to capture the whole subject in every picture? 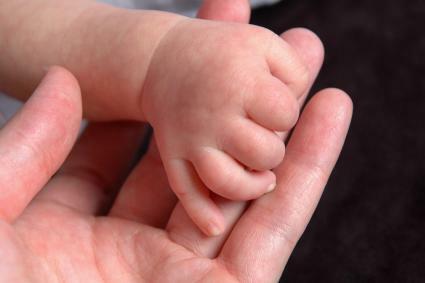 Place your baby on a silk or cotton blanket, and snap pictures of his tiny hands or feet only. These pictures will help you remember later just how small your sweetie really was! Sure, your precious little one may have beautiful skin, or he may be wrinkled and red-faced. Either way, you'll want to capture as much color as possible in lots of your pictures. But what about trying black and white for a change. The beauty of using a digital camera for newborn baby photos is that you can print the same photo in color and black and white! You can view both of them on the computer, and decide which you like better. If you don't use a digital camera, however, you can still take black and white pictures using special film. Many department stores, such as Walmart will send off the film to develop. It may take up to two weeks, but the wait is worth it! While your baby is precious to you any time of the day, there are some tips you can follow to make pictue taking a little easier for you both. Focus on different emotions-Of course, you'd like your baby to be happy all of the time, but that just isn't always the case. Snap away even if she isn't having one of her better days. You'll enjoy looking back on the various moods of your newborn baby. Bath time photos-some babies love baths, while others hate them. Still, if you have an extra helper around, let him or her bath the baby while you snap pictures. Babies can be particularly lively while taking baths, even newborns! Position-Since a lot of your newborn's pictures will be of her in a lying down position, you need to get as close as possible. Lean over your baby so that you can center him in the picture, and then snap away. Consider your baby's schedule-If you want pictures when she is happy and awake, then don't take photos of her when she is tired, hungry, or over-stimulated. Consider lighting-If you want a picture of your bright-eyed little one, don't take it in direct sunlight or bright lights. If you are shooting pictures outdoors, evening is the best time to take photographs. Sometimes you can find great deals online for developing pictures. The following Web sites often offer freebies or incentives for developing your digital pictures.